We have three games for you this week. So I should really get started. Our first game is SWAT. 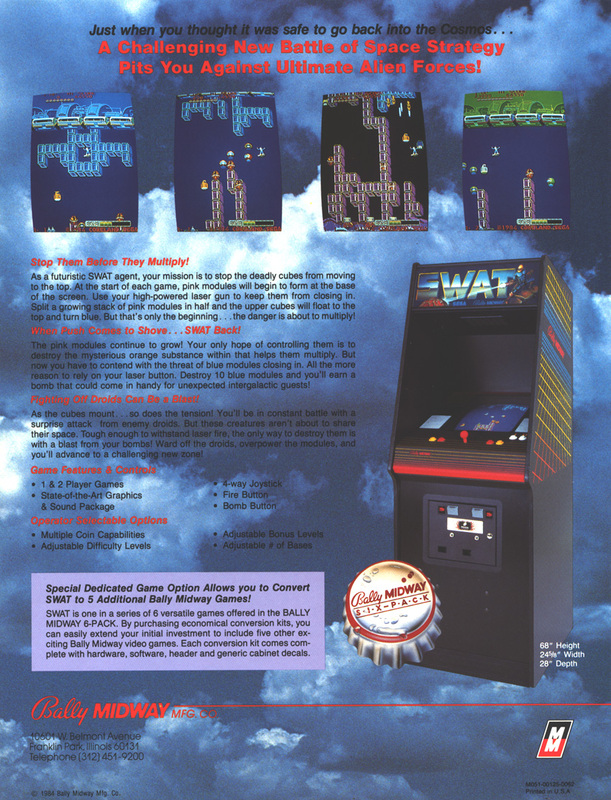 SWAT was developed by Coreland and was released in 1984 and should not to be confused with E-Swat. 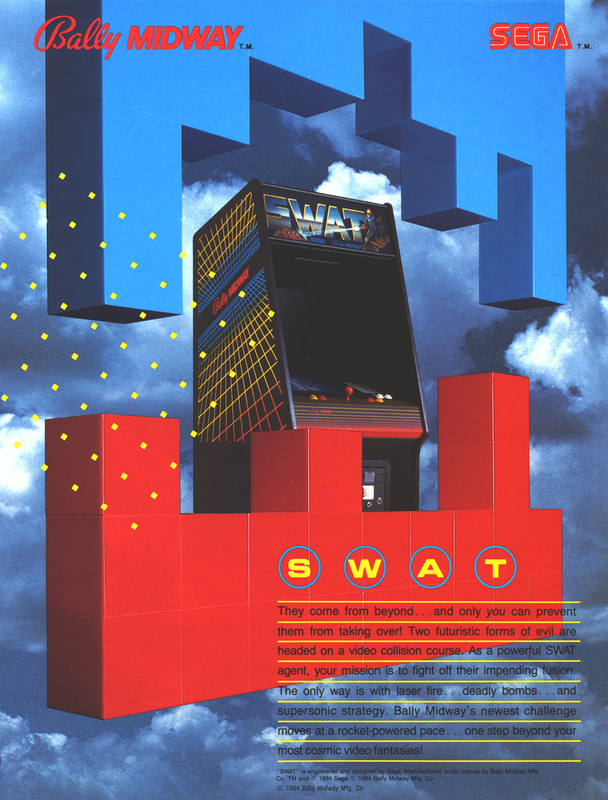 SWAT is an abstract shooter in which you are a futuristic SWAT agent. You have been tasked to stop the impending alien fusion. The enemy is building a tunnel to the top of the screen to complete their mission. For you to defeat the aliens you need to kill all the Blockers that are building the tunnels. You have two weapons at your disposal the first is a laser gun which you use to kill the Blockers, Expelers and destroy the blue tunnel units. The second is your deadly bombs which will kill everything in a small area including the Anngrers and even yourself. There are two types of tunnel units, the blue and the pink. The blue tunnel units are able to be shoved to re-align them and destroyed with your laser. Destroying ten blue tunnel units will reward you with an extra deadly bomb. The pink tunnel is unable to be destroyed by your laser or your bombs and is only able to be shoved. If you shove pink units away so they are not connected to the base they will turn into blue units for you to destroy. If the aliens do succeed in connecting the tunnel to the top a new enemy called Sweepers will appear. This will make things a lot more difficult and the tunnel needs to be disconnected as fast as possible. Next up our second game is Green Beret. 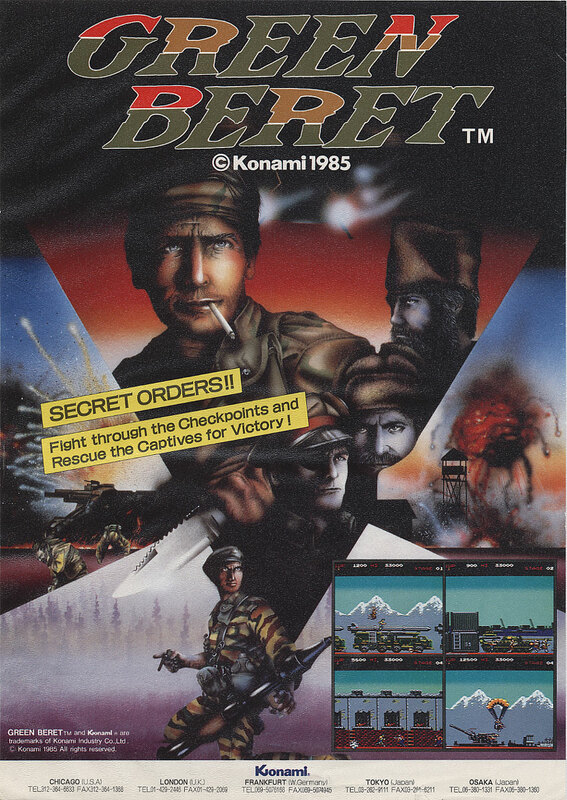 Green Beret was developed and released by Konami in 1985. You might know the game by the games USA title of Rush’n Attack. Green Beret is side-scrolling platform/shooter. You are a U.S. Spec op's soldier and your mission is to infiltrate an enemy base to save POW’s from execution. There are four stages you must fight your way through to reach the POW's. The areas are a missile base, a harbor base, an air base and last the POW camp. You are equipped with only a knife to kill the enemies that get in the way of your mission. But if you feel the need for new weaponry all you need to do is find an enemy commanding officer and kill him. Depending on which stage and level you are on he will drop a three-shot flamethrower, a four-shot RPG or a set of three hand grenades. When you have freed the POW's completing your mission the four rescued soldier's salute and the game restarts from the first stage and raises the difficulty level. Our third and last game for this week is Monster Bash. 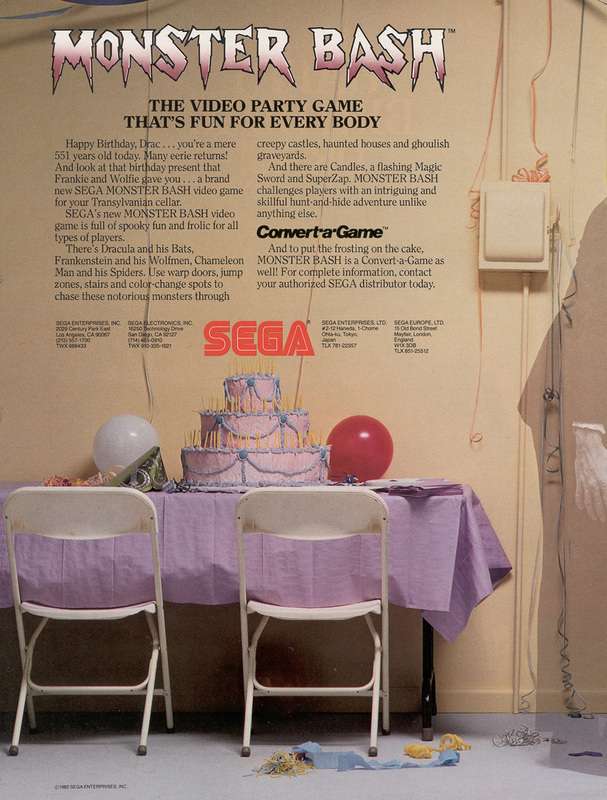 Monster Bash is brought to us by SEGA in 1982. Monster Bash is a small and simple platform game or its self called genre hunt-and-hide adventure. You play as Little Red, a boy chasing monsters in there homes zapping them. There are only three stages in Monster Bash. Dracula's House is a five story building with ladders and secret passages. Frankenstein's Castle is six stories high is also has ladders and secret passages but these passages can only be used when they are flashing. Also on both the left and right sides on each floor is a quick drop zone that both Frankenstein and you can use. 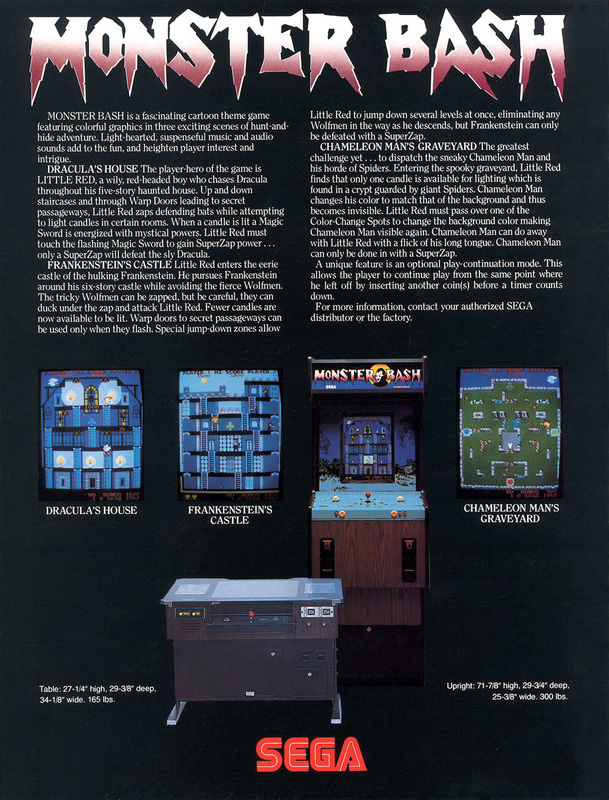 Chameleon Man’s Graveyard is more of a maze with four switches that change the maze layout. Along with the bosses of each stage you have other monsters impeding your hunt. 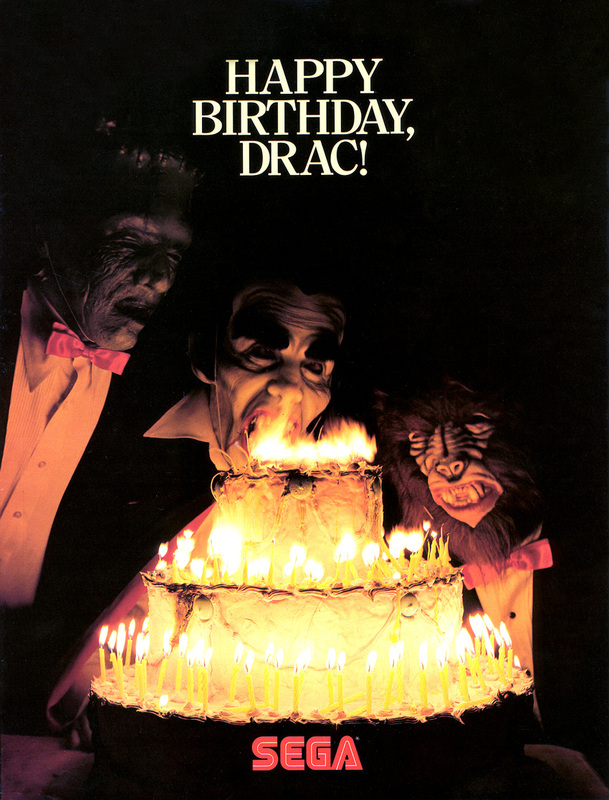 Dracula has his bats, Frankenstein has wolfmen and Chameleon has spiders. All of these monsters can be killed with your normal zap you will need something with more kick to kill the bosses. To kill the bosses on each stage you need SuperZap to be able to use SuperZap you need to light a candle on the stage. Once the candle is lit the magic sword will start flashing you then need to walk over the magic sword. This will give you SuperZap but it is only good for one shot so don't miss or you will need to go back. When you have killed all three monsters you will go back to the first stage on a higher difficulty level. Making the bosses move faster and faster.